Study Shows People Still Love Inappropriately Referencing Nazis Online : All Tech Considered Decades ago, Mike Godwin was bothered by how often digital commenters referenced Hitler. Today, Godwin's Law is still thriving, and there are numbers to show it. The longer the messaging thread, the higher the chances that Hitler or Nazis get mentioned. If you've seen Hitler in the headlines a lot lately, it's probably in the context of the presidential campaign and one particular candidate: "Why Donald Trump is Worse Than Hitler (Paste); "Trump Surrogate: He Has To Prove 'He's Not Adolf Hitler' To Beat Clinton" (Talking Points Memo); "Trump Isn't Hitler, He's Galileo" (The Daily Caller). This trope has made its way to the forefront of this political cycle, but it's picking up on a trend that has been around for decades. The I-just-got-compared-to-Hitler-on-the-Internet club is not exactly selective. Mike Godwin first noticed the phenomenon in the 1980s: People on a message forum called Usenet really, really liked referencing Hitler. In 1994, in an essay for Wired magazine, he coined Godwin's Law: "As an online discussion grows longer, the probability of a comparison involving Nazis or Hitler approaches one." A new study shows that the so-called law is, in fact, backed up by evidence. 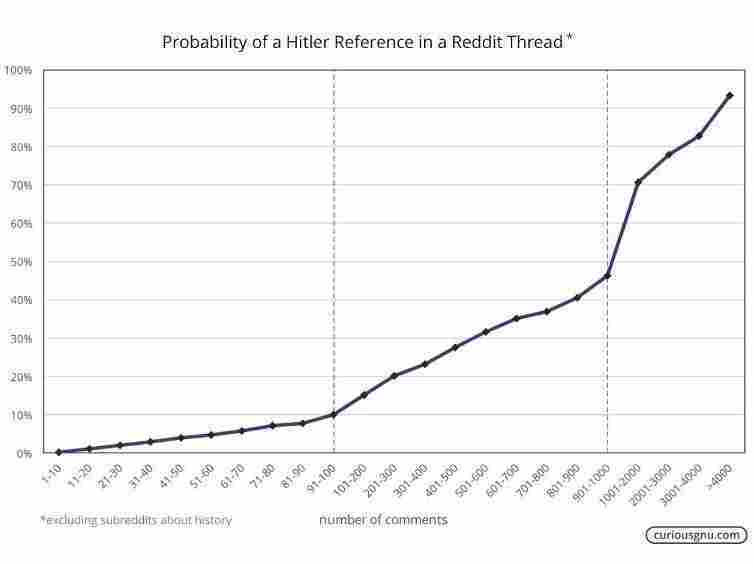 A data analyst who blogs under the name CuriousGnu has analyzed 4.6 million reddit comments to find that 78 percent of conversations that reach 1,000 or more comments mention Nazis or Hitler. "I liked [CuriousGnu's] statistical approach," Godwin, director of innovation policy and general counsel for the R Street Institute, tells NPR. "I wish I'd thought of that." CuriousGnu downplays the findings, though, telling NPR in an email: "It's obviously not a scientifically researched article, and it doesn't say anything about online social interaction." CuriousGnu asked to remain anonymous to avoid associating the blogger's employer with this research. Godwin explains that the comparison is usually out of desperation. "Discovering what other people think when they disagree with you is quite disturbing. So there's a tendency to escalate," he says. He adds that the Internet created the first opportunity for such a diverse range of people to interact in an unmediated space. But of course, the problem with such escalated online rhetoric, he explained in that 1994 essay, is that it trivializes the atrocities of Hitler and the Nazis during the Holocaust. References to them for context in historical discussions? Fine. Shorthand to insult someone? Offensive. In CuriousGnu's study, subreddits having to do with history were purposely excluded to only get irrelevant Nazi and Hitler comparisons. The contextual distinction remains important to Godwin, as he explains in a recent Washington Post article: "If you're thoughtful about it and show some real awareness of history, go ahead and refer to Hitler or Nazis when you talk about Trump. Or any other politician." In our interview, Godwin gives an example of a fair analogy: "If someone says that race or ethnic classifications are a reason for deporting people, then that starts looking a lot more like the pathological social system that we saw in Europe in the last century."